Discussion in 'Downhill & Freeride' started by saruti, Apr 17, 2008. Ive made an offset reducer cups and I'm using them on my sunday for 7 months now. My friend changes his 7point from 67 to 65. Its like a 7" sunday now. Few people buy it from me (worldwide) so I now sell it on eBay for everyone to buy. Lots of people have been specifically asking for these things from him in the past after he posted the ones on his bike. Might get a pair myself. Ya a little spammy, but lots of people want this type of thing so I'm leaving it up. Saruti, please post a picture of it in the thread though! saruti, you might want to include more info, like what head sets will work in them ect. if they are just bearings then bearing numbers. what size head tube they are made for, do you custom lenghts? Do you only need 1 cup? Or is the auction for a set? I'm still concerned that you haven't taken the bearing alignment into account. Just because the cup is an eccentric, doesn't mean the bearings are aligned. Are you making 1-1/8's and 1.5's? Is it a 2 degree offset from stock Geo (looks lie it is)? Cool idea. You may want to patient the idea before someone else does. no no, it's ok! "The cup is marked in the middle for easy installing"
**Patent** and yeah who cares if it is , people have been looking for them. Its for 1.5 head tubes with 1.1\8 forks. It is made of aluminum. I use it for 7 months with no problems and no bearings warn. You need only one cup. If youve got more questions, please ask. wow, so its only one cup and you haven't had problems with wear? that good to know. That seems really basic...and pretty expensive for 20 minutes of machining time with some 6061 bar stock. Maybe for like $30 it would be more popular. Great idea nonetheless! Wait, how the hell does this thing function properly if it is one cup with a wet thumb in the wind aligning feature???? This is the price. If you can make it for less, just do it. I dont have a workshop. I have to pay lot for making it. And I have to take days off for it. The shipping is free. Worldwide. It is really easy to install it. Its not rockets science. Im using it for 7 months and its great. No problems at all. Me no comprende' using only one cup. How can your steerer tube go through one cup made for a 63 degree HA, and out of another cup that has a 65? those are just your effective angles from the frame. technically one would be a straight cup (0*) and the other would be a slight offset (2*). I am also perplexed as to how there aren't alignment issues. Yeah, I know but it still does not make sense. Take a bike with a regular 1 1/8 headtube. i'm perplexed as well. seems to me that the bearings would bind. it would work with two cups, but even with that, the allignment would need to be perfect. eyeballing some black marker ticks doesn't seem all that accurate to me. it's tough enough to get the "king" to line up, between top and bottom, on a standard chris king headset. great idea, though, i just don't see how this works. well, since he doesn't have wear issues, seems like that 2 degrees doesn't mean much. even if it means changing bearing races every season its still pretty good. a simple and a bit crude solution, but if it works, why not. Ive tested it for more than 6 months on my bike and some friends before started selling it. Whats happening is in lower(or upper) cup is that the bearing cage is getting cocked sideays allowing the steerer to fit through. It will work, but In my mind that would eat the bearings up fairly quick and probably over time eat up the cup. He says they dont, so take my opinion for what its worth. Even if it does eat up the bearings, bearings are cheap, so it might be worth it. Now $110 seems steep but if they are the only ones available, he can charge what ever he wants. I&#8217;ve tested it for more than 6 months on my bike and some friends before started selling it. Just because your equipment can handle the additional stress of mis-aligning your headset (which is essentially what you're doing with your single headset cup) doesn't mean IT WAS DESIGNED FOR IT. There are reasons headsets require your head tube be faced and reamed before installation. There are reasons for having torque specifications on bolts or bearing interfaces. And no your headset or fork may not fail immediately or catastrophically, but when you intentionally overstep the bounds of your components tolerances you are putting yourself and your equipment at risk. This idea works, but only with two headset cups, high tolerance machining, and some very precise equipment for installing the cups with proper alignment. And for the record, Rocket Science = Mechanical Engineering = Designing bicycle components. So yes, in a small way it is rocket science. I bet it takes a while to have the tooling prepared, but once the jig and axial programming on the mill is all set, you could bust out 60+ of those in a day. Why wouldn't you be able to use two of the cups that he is selling? I'm not familiar with the headtube that he has built the adapter around, but are the top and bottom dissimilar? I realize that would be hella expensive but am just curious. The guy who makes them for me is doing it one by one. What he was saying above is not automated machining, he is just talking about setting up the fixture(s). then pumping out multiple pieces. If the guy is setting up and machining 1, then setting up again later and making a 2nd one then he is a)nuts b)charging you 200 per unit c)on COKE! You definitely couldn't use two of the same cup unless my ability to picture things mentally is completely out of whack. You'd end up with two cups pointing in the same direction but offset from one another. This is just a single lower cup that you're selling, right? I absolutely don't understand how this works without completely trashing the top bearings. Is there something here that you're not explaining to us or is it really just a single, offset lower cup? 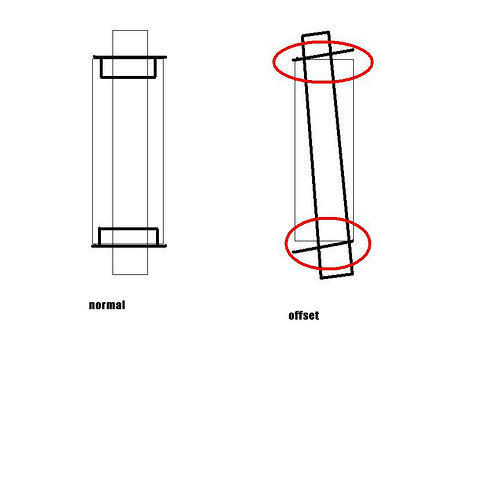 Isn't that what you want-- the same degree of offset on the opposite sides of the headtube (front to back). Essentially, from the bottom, have the fork enter the headtube closer to the front while exiting the top closer to the back? If the guy is setting up and machining 1, then setting up again later and making a 2nd one then he is c)on COKE! 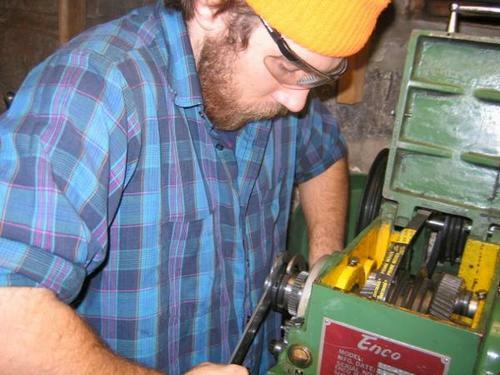 I think I know the guy setting up your fixture and fixing the headstock bearings. That's absolutely what you want. The way I figure it though, if you use two identical cups and turn one around to get things right front to back, you end up with the two cups pointing in opposite directions. If you have them both pointing the right way, they're not aligned front to back. Or I'm half pissed. One or the other. but the angle has to match. You can't just offset the holes without changing the angle of the holes. And when you change the angle wouldn't the bottom and top surfaces have to be the same angle as well? Like below, how would you sort out the areas in red?? Yep, I'm in line with you now-- they'd need to be opposite but drilled with the angles opposite one another. Hrrm, that does seem like it would be trouble with only one cup then. to the original poster, can we see an upclose shot of your bike with the cups in the headtube and the fork (without the stem)? Saruti - the design is not ideal, but good on you for doing it. Saruti - don't misinterpret the comments in the thread. I think everyone is in consensus that this is GREAT idea, we just feel that you may wanna do a little more R&D on it before you start charging a hundred bux a pop. this is what you guys want. maybe i'll try to get them done over summer.